I have been renting 2 units here since Aug. 2018...I believed that it would be a decent place to store items but I was wrong. First of all there is no one on site which is a major issue if you have immediate concerns. Another issue is no matter when you start lease on unit rent is due 1st no later than 5th if not on 6th they will restrict access and put overlock on your unit, this process is a major pain because once the lock is on they put another lock which comes from another company and only way to remove is to of course pay but then you have to put in the serial number from back of their lock into an online system that NEVER SEEMS TO RECOGNIZE THE SERIAL NUMBER...THIS IS A PAIN FOR SOMEONE WHO HAS TRAVELED A DISTANCE TO ACCESS UNIT AND STILL NOT ABLE TO GET INTO THE UNIT. NUMEROUS OCCASIONS HAVE I HAD THIS ISSUE AND HAVE HAD TO GOOGLE A NUMBER TO GET HELP OUTSIDE OF THE STORAGE CUSTOMER SERVICE! THIS IS ALSO UNFORTUNATE IF YOU CHOOSE TO VISIT YOUR UNIT ON A SUNDAY! Recently I noticed that there was rodent feces in both of my units! In my personal CLOTHES, SHOES, MY FURNITURE HAS RODENT ACTIVITY ALL OVER IT AS WELL AS MY CHILDRENS CLOTHING AND SHOE BOXES. I took pictures of this and the only thing they recommended was to get insurance when the insurance doesn't cover rodent damage! I've had to throw away clothing and personal items which was all me and my family had. I brought this to the attention of the facility with pictures of obvious rodent activity inside shoe boxes with shoes that cost over $100 I was told that management would contact me...nothing! Went to check on unit and they put overlock on it without giving me notice that they were going to do so, but I have an open case with them, now I'm threatened with paying all this money by the 20th or what little bit that we may be able to save will be AUCTIONED OFF! Once I brought it to there attention today 2/18 that I was not notified of the overlock being put on and my issue had not yet been addressed, then I was sent an email regarding an overlock but not prior to them putting it on. I wouldn't recommend this storage unit to anyone, seems more like they are concerned more with money and taking ones possessions that being sure they maintain good business practices. I didn't have rodent activity before I put my items inside the storage. I have come to this facility in early morning, before 6 a.m. or late at night and have found it to be safe and secure. My items are prone to moisture damage. The climate controlled space and access to get in anytime suits my needs perfectly. Great customer service. Private and secure. The required gate code extends to the building entry which also requires a code to unlock my storage space, in addition to using my own key for the padlock on the space. Using these multiple steps to gain entry, along with camera monitoring, provides me with the feeling of added security. I recommend it to everyone who needs storage. This facility is brand new and spotless. It is in a wonderful location and makes it convenient to my house. 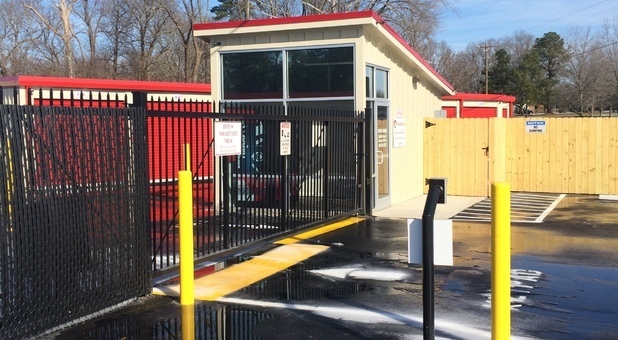 The facility is spotless and has a user friendly, secure, self access system. I highly recommend Graham Storage. Outstanding! This facility makes excellent use of technology. 10 Federal- Graham Storage Units is outstanding. I recently relocated from out of state and the "state of art" set up at the storage facility made my transition less stressful. Unable to immediately find a new home, I rented (4) 10X20 storage lockers. From the point of inquiry to "moving" day, to monthly automatic payment, the process was/is seamless. I am grateful that I came across a brand new facility and super wonderful support staff; especially Melissa---a super star! Easy convenient. Customer service excellent!! Nice clean facility, friendly and helpful customer service rep. Melissa very pleasant. Great rates I highly recommend 10 federal storage to all my friends . I found this storage facility at the corner of Hwy 54 and Long Dairy Rd. in Graham NC. I drove by Saturday night, 11:30 PM and noticed the Open sign on. I stopped and soon realized this place is open 24/7 and completely unmanned. I was able to walk into the office (at 11:00 PM mind you) and rent 2 units without speaking to one person. I had the option to call someone for help but it wasn't needed. I don't have my stuff to move in but I plan on getting it done sometime this week and to know I can do it at 3:30 AM or 8:00 PM is pretty impressive. It looks to be a heavily monitored facility with no place to hide without being seen. I am not completely sure how it's done but they have an electronic locking mechanism inside the units and a push button key pad on each building. I use my PIN# and it unlocks the gate and the unit's doors. I still had to use a padlock but the unit is secured without it. That extra level of security is in my opinion the best part. Nothing can compare! I LOVE IT!